i’ve been converting my daily grind to a more walkable system, and all my regular trips down to sunset boulevard got me thinking that i’ve got to use my local library a lot more. I thought one of my commitments could be to read more [since my personal fallacy is that i perceive myself as too busy], and use the hold system to get books from all over town transferred to my local branch. 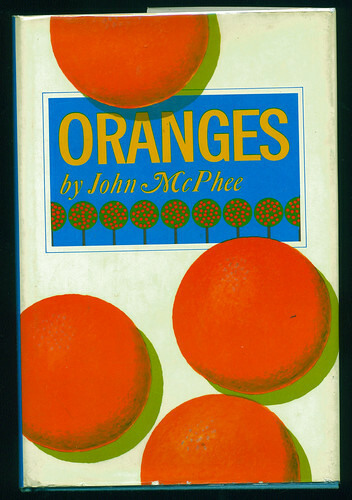 a recent good experience with the control of nature by john mcphee made me a huge fan of his style, so i decided to check out his body of work, and settled on requesting an early work, oranges. as a california native, i grew up with orange trees on the property of nearly every home, with the exception of my current one—though i have remedied this by planting dwarf kumquats, meyer lemons and mandarins in the last couple years. 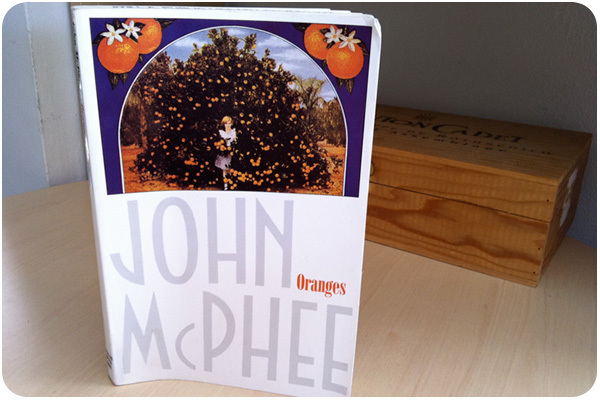 for me, oranges have always been something you eat fresh off the tree, so i was curious to see what mcphee would dig up on them. despite a publication date in 1966, oranges manages to be fairly timeless in reportage, save for then-current fascination with concentrate. in true investigative style, mcphee talks to the men who made the industry, gathering tales of best soil types, most-sought characteristics, devastations of great frosts, and personal stories of the pickers themselves. mcphee has a knack for weaving the facts of the story with rich anecdote, in much the same way michael pollan does today, for a very enjoyable, highly-narrative non-fiction read. mcphee leaves few stones unturned in his historic research of oranges, though he does favor the florida industry, giving little time to the california industry. i was surprised to learn that oranges were more used for seasoning than fresh fruit in cultures past, and that sour oranges were preferred to sweet, for their more flavorful use in cooking. my friend emily recently made an orange peel powder seasoning for our LA food swap, and i think i’ll be doing a lot more of that with my orange peels in an effort to take advantage of this delicious flavor. fascinating, too, is the near-obsession with orange juice concentrate that came to market around 1950 and would be in full bloom by the time of this book’s publication. the many industrial uses for oranges that deconstruct it far from a whole food, and break it into chemicals or flavoring agents used to falsely reconstruct fresh-tasting orange products are truly depressing to read. i have often read and said that the industrialization of food systems happened only with my grandparent’s generation, but the damage was so widespread that my parents would be indoctrinated with convenience foods completely, such that by my generation, we were raised on a ton of processed garbage even when parents gave it their best efforts. for that reason, seeing this evolution toward the end of oranges is stark, but to someone who has always been connected to fresh fruit, it should be. we should never forget how spoiled we are in california. i only wish i could have read a version with the original cover. some of my research into mcphee’s books have revealed that his publishers worked with pretty great designers, though a cursory search isn’t leading me to the designer of this one. this cover is bright and exciting, especially to the new yorker mcphee was, passing through penn station for his obligatory daily glass of fresh-squeeze that inspired him to pitch the story of oranges to the new yorker. little did he know, he’d find enough information to fill a book. since he went to the trouble, and since it’s a fantastic piece of work, timeless beyond its publication date, i think you should read it. i’ve written a profile on oranges for LAist, but there are enough different species of orange that one or another is in season to cover the full year. lately, i’ve taken to chopping up the peel of every orange i eat, spreading the pieces on a plate and drying them in the oven using the pilot heat, and then storing in a jar to add to loose tea blends. zesting your citrus is a great way to harness the oil, which is the main flavor component that allows us to perceive freshness in juice and orange flavored products [which is the reason why it was entirely separated from oranges and used to flavor other things industrially]. it’s powerful and delicious, don’t let any of yours get away.